In the wake of recent immigration raids across the Bay Area, San Jose Police Chief Eddie Garcia on Sunday spent time talking to communities racked with fear. Thom Jensen reports. In the wake of recent immigration raids across the Bay Area, San Jose Police Department Chief Eddie Garcia on Sunday spent time talking to communities racked with fear. 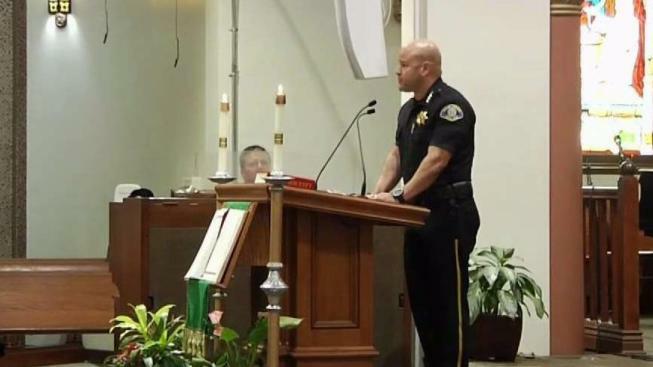 Garcia, who spoke to church congregations in the South Bay city, said his officers will resist working with U.S. Immigration and Customs Enforcement in arresting law-abiding residents. "This isn't a matter of politics," Garcia said. "This isn't a matter of being strapped or not. It really is a matter of public safety. We cannot have our members of our community afraid to contact police. We just can't have that." Among those living in fear is a woman by the name of Maria who requested not to be share her last name or show her face publicly. She's a 70-year-old undocumented immigrant from El Salvador who came to the United States 12 years ago. She walks San Jose's streets gathering bottles and turns them in for as much as $75 per day. Maria said she is afraid to find a real job for fear that she will give out her personal information and be deported to El Salvador where she'll be met with violence and where she has no family. "We recognize that there's a lot of fear in our community," Garcia said. "We know that. We've seen that there's a lot of activity."